Huntsville, AL – The Community Foundation of Greater Huntsville is awarding grants to nine agencies in Huntsville to support and enhance digital access for underserved residents. The awards will be presented at a celebration on July 24th at Yellowhammer’s Lost Highway Bierhall at Campus805. The Digital Inclusion Fund was created at the Community Foundation with sponsorship funding from Google Fiber. This fund was launched to catalyze digital inclusion efforts in the City of Huntsville by making grants to high-impact programs that will make internet access and digital education available to residents currently without access to those resources. The Community Foundation convened a Community Conversation in February to discuss digital inclusion and to prioritize our community’s needs in this area. Based on the outcome of that meeting, a public request for grant applications was issued in April, which resulted in twenty-seven applications for projects totaling $460,384.38. Following a rigorous review process by a grants committee comprised of community stakeholders, nine high-impact programs were selected to support underserved individuals from across the community. 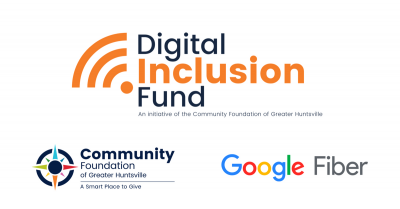 The Community Foundation of Greater Huntsville launched the Digital Inclusion Fund to support digital inclusion efforts in the City of Huntsville. With seed funding provided by Google Fiber, these grants fund high-impact programs that will make internet access and digital education available to those currently without access to those resources.